The popular Instagram’s feature called Instagram Stories has only been around for two years, but it has already gained huge audience both among individuals and businesses. It is easy to use and is often regarded by marketers as a profitable marketing platform. Although Stories can be used just for fun, brands can rely on it to increase user engagement and build a connection with new customers. Stories can also be used to fill a range of purposes, from providing insider information about an event or product to showing behind-the-scene processes and much more. Here are some tips to help your posts stand out from the crowd. Sure, Instagram Stories are less formal than regular Instagram posts, but if you are looking for success, even your Stories need to be worth your audience’s time and attention. All photos and videos should be high-quality, and any text should be short and readable. 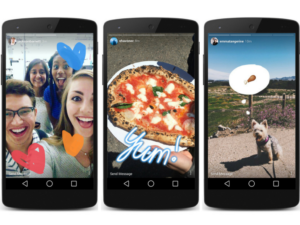 Instagram tries to make it as easy as possible for users to create engaging posts. By using stickers, you can provide context to your posts by adding location, time, or hashtag. It is also possible to tag the people who are with you. Couple these features with a short piece of text and everyone will know what your Story is about. An easy way to get viewers to engage with your Instagram Story is to ask them questions or ask them to share their opinion. There are three ways to accomplish this. You can either create a poll sticker so that people can vote, add a simple question and an answer sticker, or use a slider sticker where viewers can drag the slider to match their reaction to your question. Instagram Stories can be a good way of directing viewers to your other social media accounts. For example, if you have over 10,000 followers on your Instagram account, you can include links directly in Stories. If you don’t have that many, you can still include a link to your site or social media page in your company’s bio. Stories is a great way for promoting other accounts, build hype around your brand, and help viewers feel more connected to you. Now that you know how to create a winning Instagram Story, you need to start coming up with some ideas of your own. However, this can be easier said than done. The infographic below is filled with case studies showing how some of the most popular brands used Instagram Stories to their advantage. Perhaps you will get an inspiration after learning from the best.